Hey Verve fans! It's Julee, popping in again to announce the winner of our Up, Up & Away Ready, SET, Stamp Challenge! Thanks so much to everyone who played along! 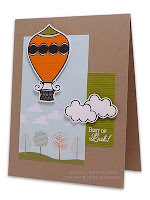 I just loved seeing all your whimsical creations with Up, Up & Away - it's one of my all-time favorite sets I've designed and seeing y'all get it inky just made me smile. Okay, enough chitchat. On with the winner's announcement. Vera who made this whimsical little clean & simple card. I just love how she built on the design in the patterned paper, and the teeny little white mat around the perfectly cut out images gives such a professional look. To finish it off, the Best of Luck sentiment from Great Expectations embossed in white balances the card out beautifully. Congratulations Vera! Email me at contests@vervestamps.com to claim your $30 gift certificate.